Regarded as one of the college game’s most aggressive coaches and top strategist, Beamer has built a solid foundation and lifted Virginia Tech football to new and exciting heights. 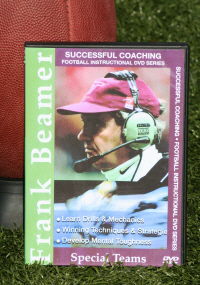 In the 1990’s Coach Beamer directed Virginia Tech to six straight bowl games and two Big East Conference Championships. Regarded as one of the college game’s most aggressive coaches and top strategist, Beamer has built a solid foundation and lifted Virginia Tech football to new and exciting heights. In the 1990’s Coach Beamer directed Virginia Tech to six straight bowl games and two Big East Conference Championships. This comprehensive video teaches fundamental coaching techniques, drills, on the field demonstrations, game footage and winning championship philosophy. Learn from this outstanding coach who believes in the fundamentals and knows how to teach them.